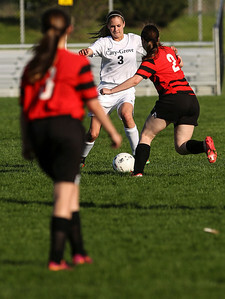 Sarah Nader- snader@shawmedia.com Cary-Grove's Carli Petersen takes control of the ball during the second half of Wednesday's Class 3A Cary-Grove Regional girls soccer semifinal against Grant at Cary-Grove High School May 21, 2014. 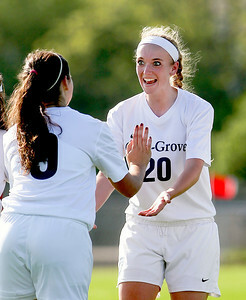 Cary-Grove won, 5-0. Sarah Nader- snader@shawmedia.com Cary-Grove's Kate Michie (left) celebrates with Cary-Grove's Jenni Phillips after scoring a goal during the first half of Wednesday's Class 3A Cary-Grove Regional girls soccer semifinal against Grant at Cary-Grove High School May 21, 2014. Cary-Grove won, 5-0. Sarah Nader- snader@shawmedia.com Cary-Grove's Abby Glaysher (left) and Grants' Meghan Murray head the ball during the second half of Wednesday's Class 3A Cary-Grove Regional girls soccer semifinal at Cary-Grove High School May 21, 2014. Cary-Grove won, 5-0. Sarah Nader- snader@shawmedia.com Cary-Grove's Candace Cunningham (center) brings the ball down field during the second half of Wednesday's Class 3A Cary-Grove Regional girls soccer semifinal against Grant at Cary-Grove High School May 21, 2014. 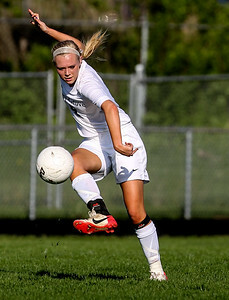 Cary-Grove won, 5-0. 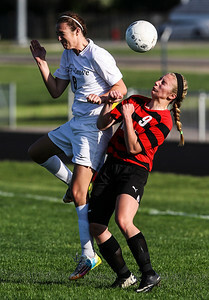 Sarah Nader- snader@shawmedia.com Grants' Lexi Gerdes and Cary-Grove's Ellie Baily case after the ball during the second half of Wednesday's Class 3A Cary-Grove Regional girls soccer semifinal at Cary-Grove High School May 21, 2014. Cary-Grove won, 5-0. Sarah Nader- snader@shawmedia.com Cary-Grove's Genna Sobieszczyk scores during the second half of Wednesday's Class 3A Cary-Grove Regional girls soccer semifinal against Grant at Cary-Grove High School May 21, 2014. Cary-Grove won, 5-0. 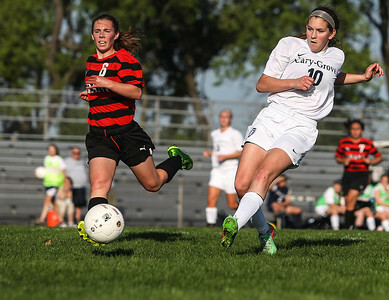 Cary-Grove's Carli Petersen takes control of the ball during the second half of Wednesday's Class 3A Cary-Grove Regional girls soccer semifinal against Grant at Cary-Grove High School May 21, 2014. 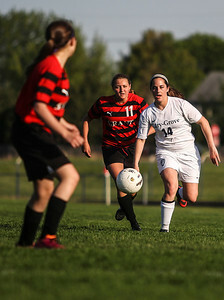 Cary-Grove won, 5-0.